Karpos was born at the base of the Dolomites in Italy. The Dolomites are filled with steep lines and possess an unpredictable nature. Karpos strives to make gear that will support people who want to challenge themselves, climb a bit higher, and see beyond the horizon. Think movement. The Alagna Lite jacket and pant is a “near suit” for racing and high-output touring. The front panel of the jacket is made of Karpos K-Shell which is windproof yet still soft and stretchy. The cuffs and medial side of the sleeves are made .. Introducing the Karpos Alagna, the high-performance speed-touring ski jacket. Hot laps on a thousand foot face in the middle of winter, peak-bagging in the spring, or the occasional Tuesday night race, the Alagna does it all. This is the platform around w..
Winning awards as one of the most advanced cold-weather speed-touring jackets on the market, the Karpos’ Alagna Plus jacket is here for your warming pleasure. Body-mapped as a tattoo artist, the Alagna Plus incorporates 60g of Polartec Alpha insulation in.. When your equipment is literally a life line, it’s good to know you can count on your gear. The Karpos Mountain Jacket is a workhorse designed for daily life in the mountains. It’s efficiently constructed to be weatherproof and durable without sacrificing.. The Karpos Lastei Vest capitalizes on the secrets of physiology and Italian design. If your core stays warm, your extremities are magically less likely to get cold as well. If you use the right materials, you won’t get bogged down with sweat or bulk. If y..
Karpos knows fleece. The Italian specialists crafted the Croda to be that perfect piece that you put on and don’t think about. 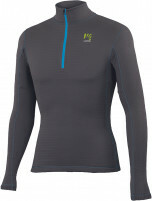 The Thermo Fleece’s checkered design retains just enough warmth while emphasizing sweat-wicking and heat-venting. It’s the perfe.. If moving fast is on your agenda, then so should be buying the Karpos Alagna Lite jacket. 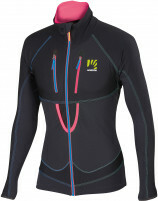 The Alagna Lite is a masterfully body-mapped jacket for racing, training, and even touring. Despite the focus on movement and breathability, the jacket offers decent.. If you like moving fast in the mountains then the Karpos’ Alagna (pronounced uh-LAHN-ya) jacket should be the staple of your ski-top quiver. The Alagna features advanced body-mapping construction where multiple Thermodrytex and Dualfit fabrics have been s..
Karpos is as synonymous with high-performance fashion as Ferrari is with fast cars. The Brendol jacket is a synthetic down puffy that’s amazingly functional with a flattering cut. Perfect for après skiing as well as staying warm when digging a snow pit or.. The Marmarole Jacket is a mathematical anomaly. Karpos describes it as 55% down and 55% fleece for a total of 110%. Well, it’s true, you definitely get your money’s worth with this one; but that’s due more to the awesomeness than the questionable math. In.. The Karpos Croda is a delightful layering piece from the fleece experts. Soft enough for a base-layer, warm enough for a mid-layer, and stylish enough for a spring outer-layer. The Croda can do it all and it’s optimized for temperature and climate control..
Leave it to Karpos to design a performance ski pant like the Alagna Lite. K-Shell fabric on the front half is windproof, traps a bit of air for some very light insulating properties, and employs a DWR treatment to protect you from the elements. However, K..
We aren’t entirely sure if the Alagna pant (pronounced uh-LAHN-ya) is supposed to be the ideal training pant for racers, the snug pant for backcountry skiers, or the “quiver of one” pant for light ‘n fast skiers. What we do know is that it’s awesome and t..
For those of us that sometimes wear spandex and use normal-size skis (often called “skinny”), the fashionable touring apparel is too bulky to get where you’re going. On min-winter foul-weather days, however, the only thing warm enough might be the aforeme.. Amply lined with soft and breathable fleece, the Karpos Express 300 is the go-to pant for frigid skimo adventures. Run cold? Ambitious expedition? Midnight powder skiing in a January storm? The Express 300 has you covered. Literally. Touting one of the mo.. The age-old Nordic saying “There is no bad weather, only bad clothing” rings true for anybody that spends times in the mountains. The Karpos Schiara pant is here to make sure bad weather is a thing of the past. Now you don’t have to be confined to bluebir.. When diverse sports like skiing progress, the gear often lags behind the trends and is outdated by the time it’s introduced. Luckily, there are a few companies like Karpos that have their ear to the ground and are interested in the progression of ski-moun.. Recent studies show that owners of Karpos pants have a higher quality of life. This is especially true for skiers that own the Alagna Lite Pant. Such folk are often found alone at the top of peaks or passing people in the wee-hours of a resort-skinning se.. Warm, stretchy, comfortable, and high-performance; what’s not to like? The Alagna is the staple high-speed touring pant from Karpos; popular for good reason. Thermodrytex Double, the mainstay fabric in the Alagna, is very breathable and sports a DWR finis..
Karpos’ has a long tradition in fashion-centric Italy, and once you wear the Express 300, you’ll realize why the company’s reputation is so strong. The pants sport a DWR finish from top to bottom that will readily repel dirt and water, meaning you’ll be c.. The quality and attention to detail that Karpos presents is almost unmatched, which is why the versatile Mountain pant is one of the mainstays of their lineup. Sporting a top-to-bottom DWR finish, the Mountain pant will repel water, dirt, and other contam.. The time has come to introduce the North American market to the most Italian skimo race suit ever created. Karpos is the official supplier of the Italian National Team and with the help of Damiano Lenzi, they have unveiled a suit that is as sleek as a she..
More Italians have been on top of podiums than any other nation. Be it skimo racing, car racing, motorcycle racing, trail running, pasta making, you name it, the Italians have been there and done that. Italians are steeped in success, and the Karpos Race ..